This is my Winter 2016 Jewellery Collection for Primavera Gallery. My designs reflect my fascination with various shapes that don’t necessarily need to be perfect. 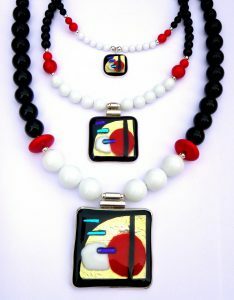 The materials I used are fused-glass pendants set in sterling silver, white jade (this is a vibrant white colour that reminds me of big white snow flakes floating down from the sky), red-dyed coral, and onyx. The collection is now available at the Primavera Gallery in Cambridge, UK.